Tag 4 people at the end of your post linking to their blog. Let each person know they have been tagged by leaving a comment on their blog. 1. My hair is brown, but it reddens with age and sun. When I was about ten I stayed with my cousins for two weeks in the summer and when my mom came to pick me up she screeched, “What did you do to your hair? ?” thinking I’d dyed it because we had spent the whole time playing outside. 2. I never went to high school. But I did go to a prom, my cousin’s. 4. I’ve been a vegetarian for thirteen years. I remember my last meal of meat: pork chops, made by Mom. 5. According to my in-laws and ex-employers, I don’t smile or show my emotions enough. I contend that showing my emotions is not necessarily desirable, especially in the situations in which this comes up. Also that I would not be told to smile if I were male. 6. Altogether I’ve taken several years of both ballet and fencing, but I haven’t gotten better than covering the basics of either because of what classes I took and when. Also, on a strictly gardening note: (1) everything seems to have survived the frost fine and (2) the borage sprouts are really scaring me now. I also hear they spread like mint. I have this small bed surrounded by cement with a roof edge mostly covering it, so almost nothing grows. I’m tempted to see whether borage could take over that bed, and if it can, bless it. I was playing WOW with a friend of mine who lives near Cleveland last night, running across The Barrens and chatting about work and irritating customers. “That doesn’t sound good,” Eric commented, looking out the window. It didn’t sound good; it sounded like icy snow; so I told Courtney > BRB, I think it's snowing and I need to cover my plants, and went out into the darkness. I brought a pot and the ice cream bucket (incidentally, it’s occurred to me that salt water would be a great way of killing the weeds in the strip between our garage and the neighbor’s yard that I just want to cover over with gravel) and mainly used my hands to find the two herbs in the herb garden I was afraid for in order to cover them. Everything else took its chance. I lugged the lemon tree inside and covered the winter-sown containers. I returned, dripping and muddy, to the computer room. > Is it snowing? Courtney asked. > It's hailing, I said. Tonight we have an actual frost advisory (which I find completely charming–that they make an actual advisory, that is, not the frost itself). I’ll go out earlier tonight. 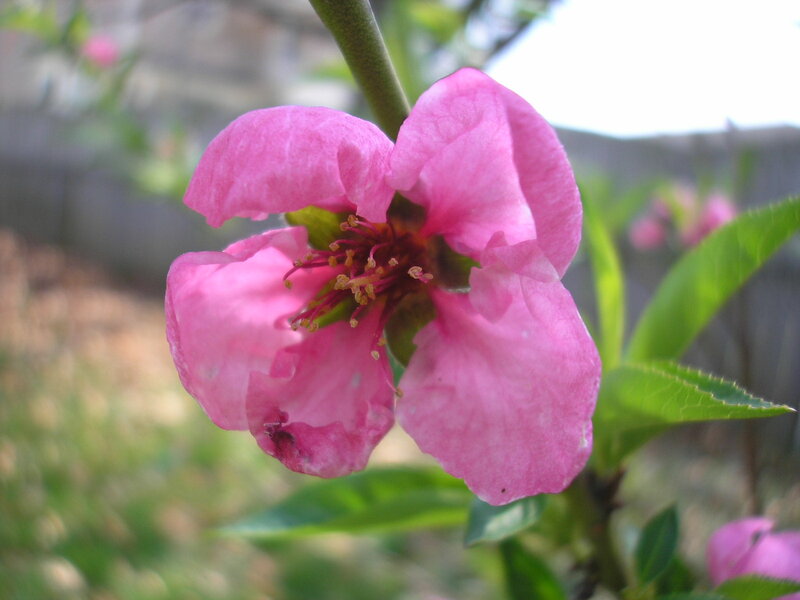 I don’t think it was the same flower, but the tree was uniformly pink both times. On second thought, there will be at least some hands-on gardening today. 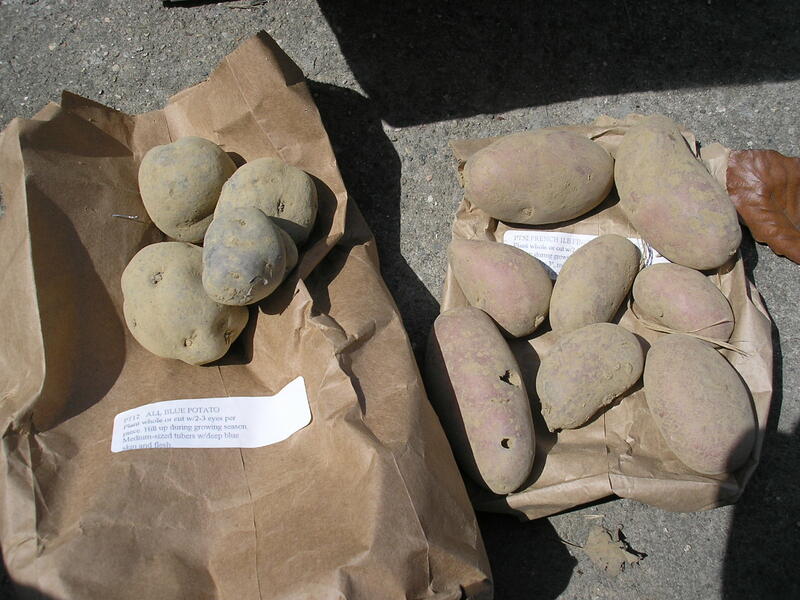 The potatoes are here! The farmer’s market was open-air today. There was a chilly wind so this wasn’t ideal, but still, they’ve opened up for the season. That’s marvelous. The full complement of vendors haven’t returned yet, but there are some new ones: a honey booth and an incense booth and several vendors with flowers and plants. I think that will be an excellent place to get flowers for the mothers for Mother’s Day. Maybe next weekend, to avoid the rush the weekend after. While driving there–it’s three miles–I noticed a bee crawling around on my back windshield, on the inside. It must have been there since yesterday, since I had the windows open then and didn’t today. Well, I did once I spotted the bee, but it apparently liked being where it was. When I parked I got outside and pounded on the glass to get it to move, but it didn’t. I left the window cracked and told it to be gone by the time I came back. The staunch All Seasons Produce, which has been there throughout the winter, was there with hydroponic strawberries and a variety of greens, including spinach. I bought spinach and onions, hoping that in a few weeks I won’t be buying spinach anymore. Across the way, a newly-returned vendor had plants galore: strawberries, tomatoes, herbs, broccoli, cabbage, pansies, viola, perennials. I bought two strawberry plants, a Silver Mound artemisia, and lavender cotton (yellow-blooming, despite the name). $4.50. I went to the Poultry House to get eggs and realized I was an idiot for not guying more–you can’t get plants this cheap anywhere else and I need more strawberries than two since mine are clearly not coming back. Ah well. I’m going back next week, after all. When I arrived home I put the plants outside to harden off, though this isn’t the best time to do so since it’s going to snow on Monday. Then I spent half an hour pottering around outside, pulling the occasional weed but mainly cheering for true leaves, pondering whether I should have put the broccoli where the Asian cabbage is (it’s doing the best of anything in the garden), admiring the flowers on the lungwort and the peach and the unknown tree by the front porch, and thinking about where I’m going to move various plants. Does it count as gardening if I didn’t get my hands and jeans dirty? In this case I’m going to say yes. The onions are starting to come up. 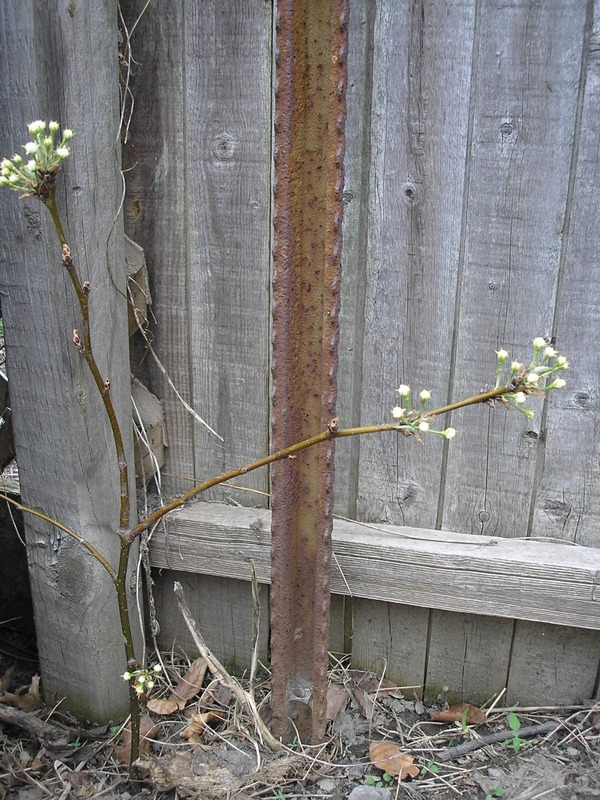 Not enough to think about cutting their tops yet–most of the tops haven’t fully pulled free from the ground yet–but enough to stop thinking about what I might plant if they completely failed to come up. My potato order from Pinetree has been charged to my credit card for almost two weeks now, but I have received no potatoes. This saddens me. However, last night’s rain did good things for the parts of the garden that are here, so I shouldn’t repine. They’ll get here soon, I’m sure. I have an eggplant sprout! From one of the old pots, not the new ones. Which just goes to show. No San Marzanos yet. No luffa either. The borage, though, is strong and bold. Borage kind of scares me. I also, upon coming back from a walk this evening, realized that the curly grasslike things that the previous owners left in the little corner bed (the plants from which I’m slowly relocating because they don’t grow well there because it’s directly under an enormous copper beech) are wild onion. I tested this theory by tasting. Yup. Wild onion. Which leaves me in a conundrum: leave them where they are and let grass grow around them; plant them somewhere, thereby denying their wild nature; or pull them up and use them in cooking this weekend? I had a $75 gift card for Amazon, courtesy of a market research interview I did. Eric wanted to use it for purchasing his Fourth Edition D&D books, but I said we were spending at least as much on me as we were on him. So he got his books preordered and I have an Ingrid Michaelson CD, Local Breads by Daniel Leader (sourdough and whole-grain European breads), and Seed to Seed. 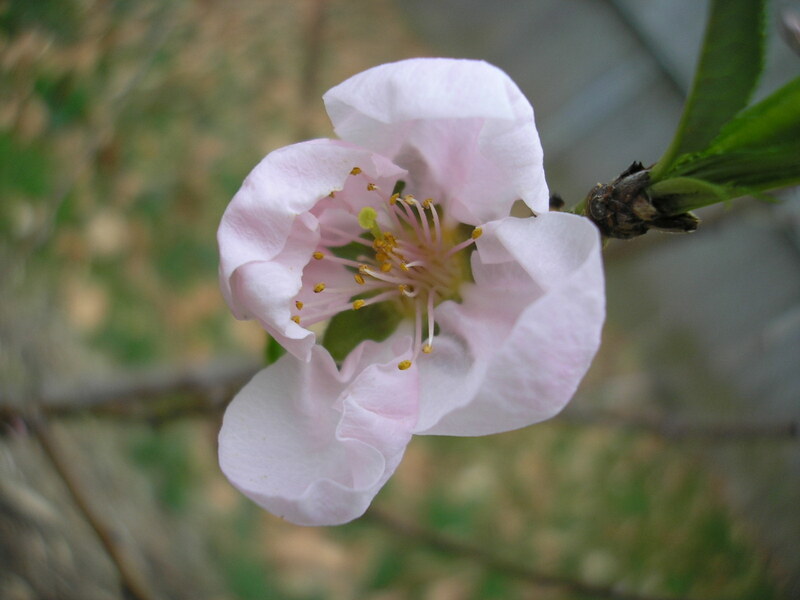 I notice the peach tree is now blooming in two colors, and I dug and raked the last of the garden beds today because it’s the last nice weather we’ll have for a while–back we go to our regular spring weather–but that’s all. Must go now. Reading. Back to the minutia of gardening. (Not that I ever really leave it.) I dug up what I thought were spotted hostas in the front yard, and the past two days I’ve noticed they’re blooming a lovely periwinkle, and it’s the wrong season for hostas to bloom. Today I looked them up and found they’re lungworts, pulmonaria (of course). Hooray for learning more plant names! I dug up the west bed and the raised bed in the vegetable garden today, to mix in the compost and turn over the weeds. I was charmed by how in the raised bed I didn’t have to use my foot on the shovel to sink it into the soil. I was less charmed by the chunks of wood I tore away when I accidentally hit the sides of the raised bed. I may want to look into replacing the walls this year, one at a time, so that I don’t have to replace them all at once next year. I put up the bean teepee yesterday–three long branches from the overgrown tree in the backyard, two of which had bright green leaf buds even though I cut them weeks ago–and planted three beans today, to see whether the rabbits are visiting that part of the yard or not. Both kinds of peas are up and un-nibbled, but I’m not convinced that the beans are safe without a fence. Yesterday I also discovered tiny dill seedlings in the strawberry bed (last year’s herb bed), so I deduced it was time to sow dill and cilantro seeds, and did so. I also planted more alyssum, and some lavender right over a swarm of ants. There’s a nest there somewhere. I may have to bring out some boiling water soon (the entrance to the nest, as far as I can tell, is not where I put the lavender seeds). The brassicas, and the Tuscan Blue rosemary I bought and the oregano I grew from a cutting of last year’s plant, are outside. The brassicas have collars. I now have two Green Goliath broccoli, two Sorrento broccoli, six Romanesco broccoli, six Snow Crown cauliflower, and six Chinese cabbage out there. I know I let the cutworms get the best of me but I could have sworn I started more broccoli than that (especially since I don’t really consider the Romanesco a broccoli–though we’ll see how I feel if and when I get to taste one). I also cut a branch off the Asian pear a few weeks ago and stuck it in the soil. I looked up suddenly while digging and found it was covered in white buds, just like its parent. Does that mean it took and is growing roots, or just that it hasn’t realized it’s dead yet? The peach tree we planted last year has similar buds, but carnation pink and quite lovely. Flowers are more fun when I know they will (theoretically) lead to fruit, I think. I can’t wait for the raspberries to flower, or to buy more strawberries. Maybe the farmer’s market will have them this Saturday? Between then and now, I’ve got the east vegetable bed to dig and rake, some more weeding to do, and the yard to think about taking care of so that I don’t plant everything now just because the weather’s so lovely. In summary: lots to do in the garden. Work’s been crazy this week too. It was just like this a month ago, and–guess what?–the full moon was a couple of days ago. I’ve been having very full days, and that’s making for a good April. I haven’t paid real attention to Earth Day in previous years. I can’t promise I will now, either. I don’t pay a lot of attention to media, and I tend to think that what happens between the annual events–the everyday actions that people take–matters more than a day’s worth of celebrity cameos and online games for kids. But I do look forward to all the posts about it. I don’t feel versed enough in current scientific thinking and the plethora of opinion and advice to discuss the topic of climate change and our environmental impact; but I’m thinking and reading and learning–and hoping. I just got back from Katie’s post on the day, and wanted to repeat what I commented there, my favorite quote. That’s Margaret Mead, and the quote appears in many slightly different versions, so I don’t know what her exact sentence was (I favor this one, obviously), but no matter how it’s phrased, my eyes always prickle when I think of it. Thinking about Earth Day, in the context that we need it because the state of the planet is getting so bad and nobody’s paying attention otherwise, is a bit despair-inducing; but hearing about people, all around the world, who know that change needs to happen and are doing it and spreading the word lifts my spirits. We can change the world. However, my only world-changing activity today (unless something I do at work results in a medical breakthrough that saves millions of lives in a totally unforeseen way) is to work in my garden. The Golden Sweet peas and the scallions are coming up outdoors, the borage and thyme are coming up indoors, and it’s time to plant brassicas and start getting the rest of the vegetable garden ready for sunflowers and beans and tomatoes. Maybe that’s enough for one day. I love the idea of a White House vegetable garden, as described in this article about the resurgence of vegetable gardens. I’m sure they could have a red/white/blue theme, even in vegetables. It’s intriguing that overall gardening sales are down but vegetable and herb gardening sales are up. Where are all those flower gardeners and yardeners going? The article itself is a little disjointed–I didn’t see a cohesive narrative so much as a couple of glimpses of current trends and the writer’s thoughts–but the information is interesting. I’m glad vegetable gardening is getting more popular, though not terribly surprised; I imagine it will continue doing so as long as current economic problems last. But popular is good. For one thing, it means more seeds and plants and other products available to me in stores. For another, I suspect it’s better for the people doing the vegetable gardening. Michael Pollan weighed in on that last. I wholeheartedly agree that getting people to garden is more than getting them to do something about their food supply: it shows them that a little work and care on their part will provide them with some of the most basic necessities of life, that nature really works, that their own small actions really can make a difference. I felt that last year. I’m starting to feel it this year. In today’s atmosphere of recession and climate change and manufactured-goods-are-poisoning-us and general worry, feeling I have the skills and power to make a difference–in my own life and in the good of the world–means a lot to me. I bet it would mean a lot to others, too. I find myself wanting to proselytize people around me to gardening. And if they grow their own vegetables I won’t be able to unload my excess produce on them, so it can’t be for selfish reasons. I think it’s this: I’d like to share the victory inherent in bringing up a plant and harvesting food from it. Everyone needs a little victory in their lives.